Algeria has revealed that it is operating self-propelled mortar systems acquired from China in what is the latest acquisition of military hardware from the Asian nation. Six SM4 systems were seen on 7 January during Exercise Borkane 2019 held in Sidi Bel AbbÃ¨s province. The exercise was witnessed by Chief of Staff Lieutenant-General Ahmed GaÃ¯d Salah during a visit to the 2nd Military Region. The exercise involved units from the 36th Motorised Infantry Brigade and 8th Armoured Division. The SM4 is a 120 mm self-propelled mortar system developed by Norinco. It was first unveiled in 2014 and is based on the chassis of the 17 ton WMZ551 6×6 wheeled armoured vehicle, which has a top speed of 100 km/h. An air conditioning system is fitted as standard and the vehicle retains its fully amphibious capability. The mortar is housed in an enlarged compartment at the back of the vehicle and fitted with a recoil reduction system so that stabilisers are not required when the weapon is firing. The system is able to fire a variety of 120 mm ammunition, including high explosive, pre-fragmented high explosive and rocket-assisted high explosive shells. Firing range is between 7 500 and 13 000 metres depending on ammunition type. Up to 30 complete rounds can be carried, with a maximum rate of fire of 12 to 15 rounds per minute. 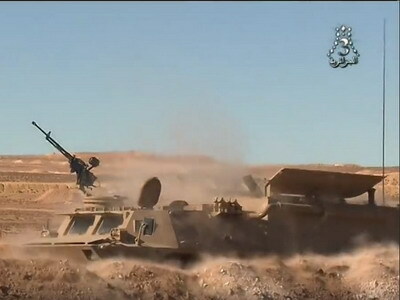 A pintle-mounted 12.7 mm machinegun is mounted on the vehicle for defensive purposes and manned by one of the five crew members. China has developed the WZ551 into a multitude of different variants, including 73 mm cannon, air defence artillery unit (23 mm), surface-to-air missile variant and anti-tank missile variant. Algeria has received a significant amount of military hardware from China in recent years, from ships to unmanned aerial vehicles (UAVs). Most recently, in October 2018 it emerged that Algeria was operating CH-3 and CH-4 UAVs built bythe China Aerospace Science and Technology Corporation (CASC). In May 2018 it was revealed that Algeria was operating W86 120 mm mortar systems from Norinco, which has been mounted on Mercedes G-Class vehicles and deployed via a hydraulic system. Algeria has two Norinco artillery systems in service: the 155 mm PLZ45 self-propelled howitzer and SR5 multiple rocket launcher system (MRLS). On the naval front, Algeria in 2016 received the last of three C28A corvettes built by China’s Hudong-Zhonghua Shipbuilding Group, a subsidiary of China State Shipbuilding Corporation. The 120 metre long corvettes are armed with a 76 mm main gun, FM-90N launcher for HQ-7 surface-to-air missiles and YJ-82/C-802 anti-ship missiles. According to the Stockholm International Peace Research Institute (SIPRI), since 2010 Algeria has also received from China 18 WA-021/Type-88 155 mm towed guns.